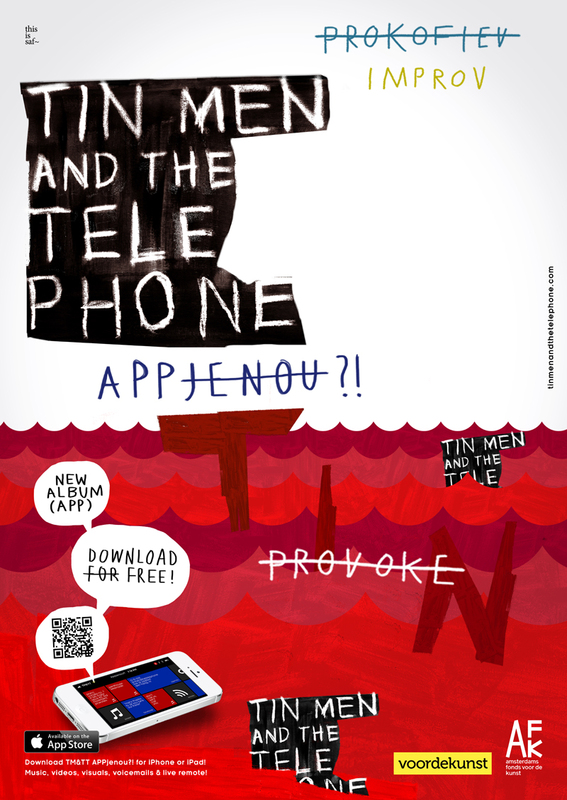 In 2013 Tin Men and the Telephone developed their first app: Appjenou?! which was meant as an alternative for a CD or DVD. 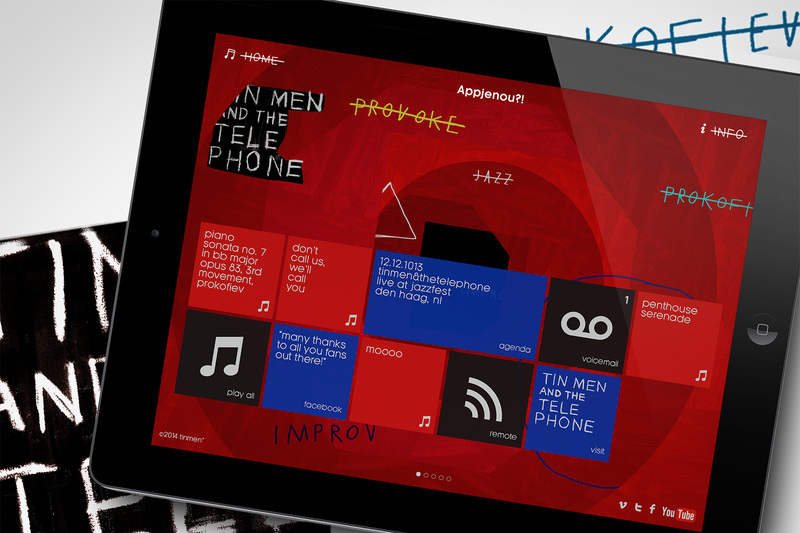 The app-format seemed to fit the band’s work perfectly as it allows for both user-interaction and visuals. Appjenou?! presented songs that each had unique forms of interaction and was inspired by Bjork’s app Biophilia. The one feature that differentiated Appjenou?! 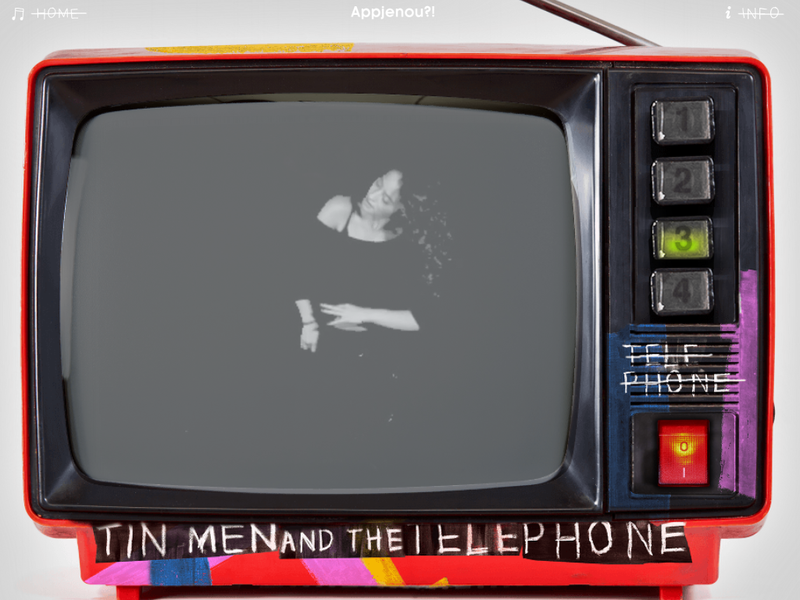 from other music apps would prove to be decisive: a live remote control that could only be used during the band’s concerts and that invited the audience to participate and influence the music on the spot. 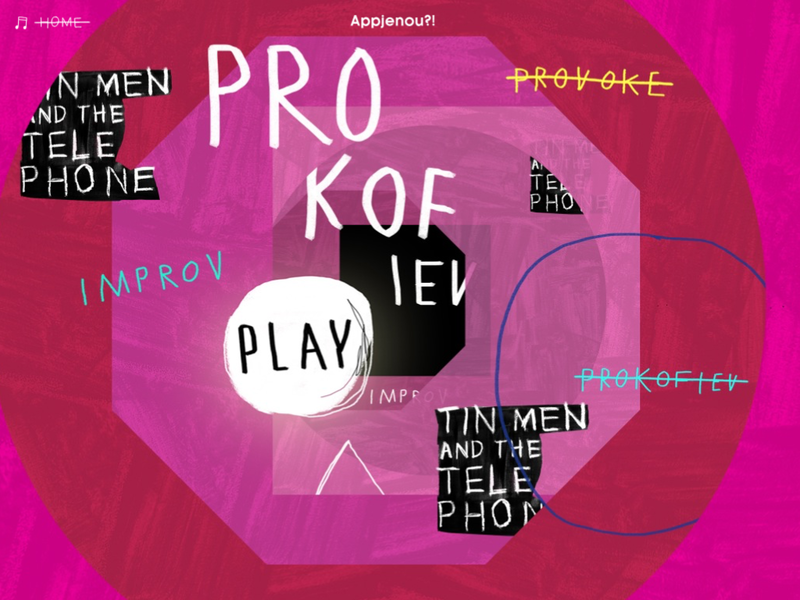 What started of as a (costly) experiment, premiered at the Bimhuis in September 2013, eventually led to a whole new way of performing and a new app called Tinmendo. The Cow features multiple different takes on the same sequence of cow sounds. 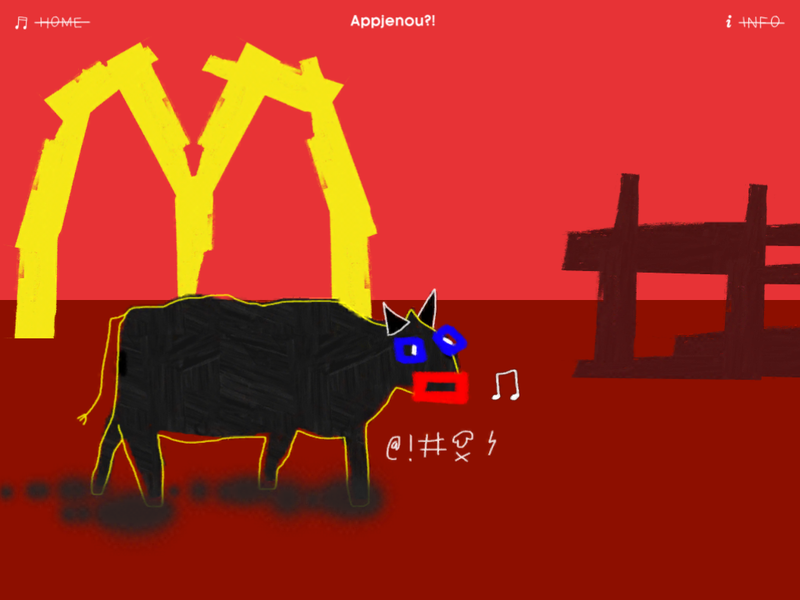 By dragging the cow around the user can choose which version they would like to hear, or switch back and forth between takes. In Precipitato, an arrangement of Prokofiev’s 3rd movement of the famous 7th piano sonata, the user flies through a 3D space with tunnels, fields, water and crazy objects. 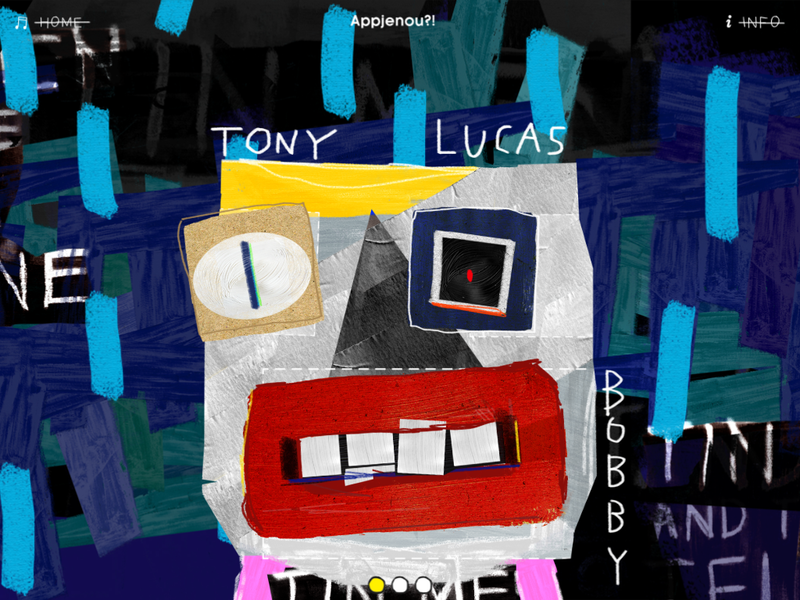 At specific moments the player can change directions, which leads to very different visuals, musical arrangement and solos. The piece lasts around 15 minutes and has more than 70 minutes of hidden material in these different routes. The arrangement can be manipulated in real time by switching on piano, bass, drums, viola and guitar. The guests featured on this track are Oene van Geel (viola) and Anton Goudsmit (guitar). 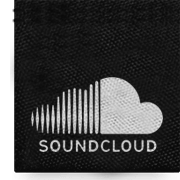 Don’t Call Us We’ll Call You is a drum and bass piece that needs to be constructed from the ground up. 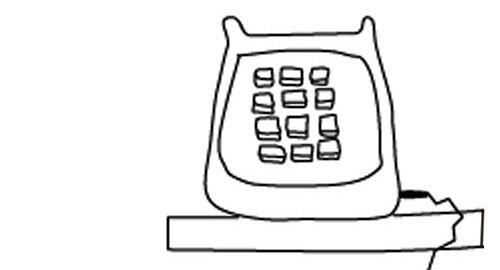 The user creates a face by dragging and moving around with two fingers. Left eye = keys, right eye = bass, mouth = drums. The size of eyes and mouth determine the intensity of playing for each instrument. Tin Men recorded many takes that were layered and allow for the construction of countless versions of the song. Different sections of the song can be discovered by swiping to a next page. Penthouse Serenade follows a similar principle as the Cow; music is music and every piece of music can be performed in different styles. By changing stylistic elements, the music can easily move between distinct musical genres whilst remaining the same song. In this case, Tony recorded multiple versions of one of his favourite jazz songs: Penthouse Serenade by pianist Errol Garner. Separate take feature a honky-tonk piano, a grand piano as well as keyboards such as the Prophet V, Moog D and Oberheim Matrix 6. Switching between the different tv channels shows the song in different genres together with the amazing dancers Raquel Tijsterman and Arnold Put. Unfortunately, Appjenou?! 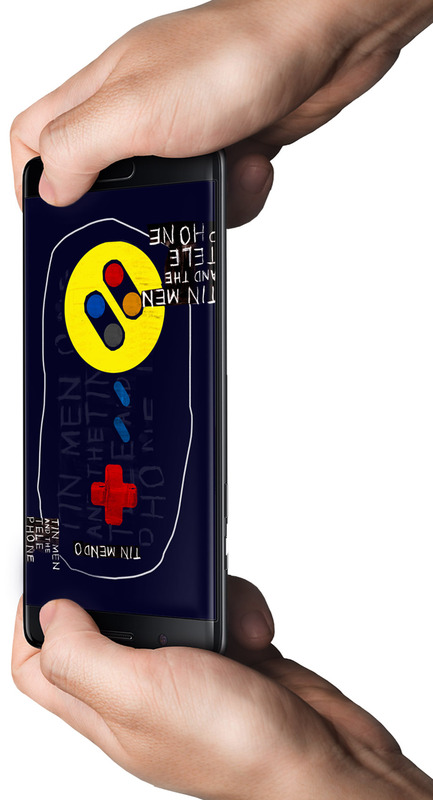 does not run on the current versions of the Android and iOS. Due to the high programming costs involved, an update isn’t yet in the works, but there are plans to release all songs as separate web applications instead.